I had so much fun making Lydia and John’s super-sparkly 5 tier wedding cake! 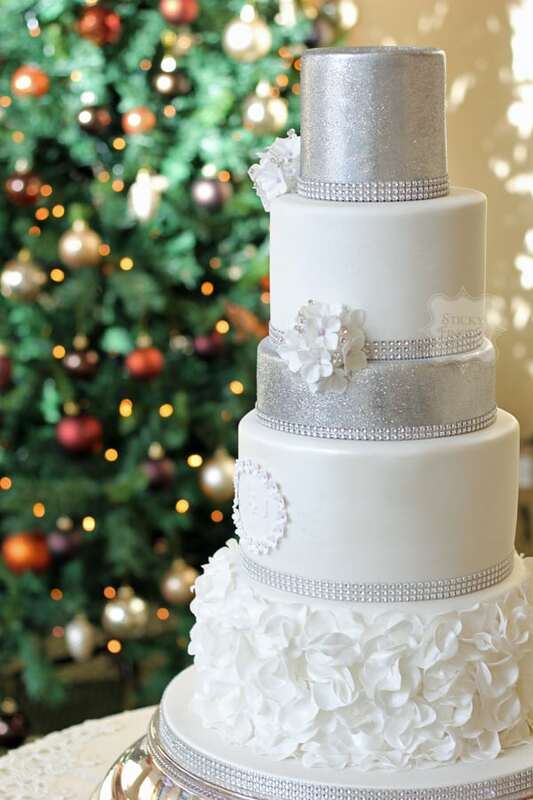 The brief was to make their wedding cake as sparkly and glittery as possible to fit in with their wintery theme so they had their top tier and 3rd tier covered in silver glitter. These were dummy tiers as the glitter, although food safe, isn’t something I encourage couples to have on real cake. The other tiers were sprayed with edible pearl lustre to give them a pretty glisten and the bottom tier was decorated with sugar petal ruffles (which I love! ), along with an initial plaque on the 4th tier and clusters of hydrangea petals – Lydia carried white Hydrangeas in her wedding bouquet. Yummy flavours of Strawberry & Champagne, Cherry Bakewell and Dark Chocolate. Huge congratulations to the happy couple, wishing you all the happiness for the future!